Visit TelegraphJournal.com and subscribe to gain full access to online and printed news content. Two professors from the University of New Brunswick have returned after a week in New York City for an international summit looking at solving world hunger through the use of open ‍data. Dr. Chris Baker, chair of the computer science department at UNB Saint John, and Dr. Bruce Spencer, adjunct professor in UNB Fredericton’s faculty of computer science, recently attended the Global Open ‍Data for Agriculture and Nutrition (GODAN) summit. “The GODAN group represents 340 organizations, at least, that are interested in open ‍data and agriculture and nutrition. And in particular, empowering people who could make best use of that ‍data to improve their lives and improve the economic health of the people and their families,”Spencer said in an interview. GODAN was created after a 2012 commitment by leaders of the G-8 countries, with backers such as the governments of the U.S., U.K. and Kenya. The GODAN group believes by making agriculture and nutrition ‍data more openly available, farmers will be able to work more efficiently. “We know that in the future, we’ll have a much larger number of people on the earth. We’ll have less arable land, drought, climate change, we’ll have rising oceans, so we’re going to lose some of the land around the coasts,” Spencer said. Spencer said the ‍data people need access to isn’t unknowable or mysterious information. “It’s things like, what are the properties of a specific crop. If I choose to plant this crop, what kinds of diseases are currently known or pests that can attack that? What can I do about getting the market information?” Spencer said. Baker was invited to the summit earlier this year by GODAN’s executive director, who spoke at an Open ‍Data Summit in Saint John. 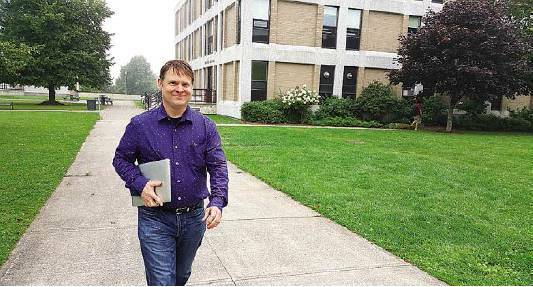 Baker is also CEO and co-founder of IPSNP Computing Inc., a Saint John company with a focus on big ‍data that provides user friendly interfaces to make for easy querying of complex ‍data. He and Spencer, who is a senior consultant for IPSNP Computing Inc., had a booth and exhibit at the summit showcasing how to use technology and ‍data to figure out things like which crops to grow, what will be the most profitable and looking at the impact of pesticides on bees. “If information is published in a way that only a computer programmer can access the information, it’s not really going to get to the farmer really easily. Or if it’s released and a farmer has to learn a special query language to get to the ‍data, again, that’s also not going to help them,” Baker said. Baker said there are many socio-political issues that need to be addressed. “The problem is clearly multi-dimensional. The issue with releasing information are often to do with policy, proprietary nature of some of the ‍data, anxiety about how it would be reused,” he said. Baker said the summit provided them with over 50 leads such as investors, venture capitalists and philanthropic funding agencies. “We got to meet these representatives of these organizations and really communicate the value that we bring,” Baker said. Spencer said there was a willingness to create solutions and form partnerships. “The biggest takeaway for me was the commitment expressed by all the delegates and the organizers on the agreement on how important the problem is, how multi-faced the problem is and how much we need to propose and create solutions,” Spencer said. Spencer said the next step is to start working on a pilot project. Dr. Chris Baker, co-founder and CEO of IPSNP Computing Inc. and chair of UNB Saint John’s faculty of computer science, recently returned from an international summit in New York about harnessing open data to solve world hunger.